In the Country of Men has been on my radar for a while, but I read it this month because it was the July choice for the ABC Radio National Africa Book Club. I was disappointed in their book list, because nearly all the authors chosen are well-known expats rather than authors who actually live and write from within African countries. The book club was an opportunity to introduce less familiar authors and to support the fledgling African publishing industry, but unsurprisingly since the books were chosen by popular vote, it turns out that the list consists of well-known books by well-known authors who are published by global publishing companies. And while I don’t consciously read and review for gender balance, I was surprised to see only three books of the ten were by women, and the list didn’t include great feminist authors like Bessie Head and Amma Darko. And no Zakes Mda or Helon Habila! OK, off my soapbox, what about the book, eh? Hisham Matar was born in the US, and spent some of his childhood in Tripoli until political repression forced his family to take exile in Cairo. He moved to London when he was 16 and completed his education there. 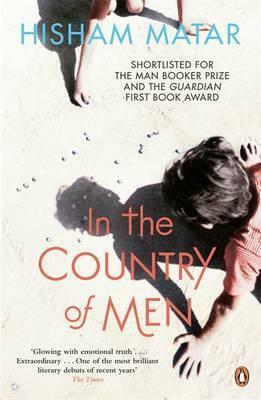 In the Country of Men is the only book I’ve come across set in Libya and it was shortlisted for the 2006 Booker, so I ordered in a copy and read it over a couple of days. It’s a poignant coming-of-age story in which a nine-year-old narrator has to confront the tragedy of life under the dictator Muammar Gaddafi. The early chapters reveal Suleiman’s childhood, and his unusually intense relationship with his mother. An only child, he is her only compensation for an unhappy forced marriage, but he is not enough. When her much older husband Faraj is away ‘on business’ Najwa drinks herself into a stupor, and it’s a risky form of substance abuse because it’s not only against their religion, it’s also illegal. Suleiman thinks that she is ill at these times, and that the alcohol is medicine, and he feels protective towards her. Before long the novel takes a darker tone with the arrest of his best friend Kareem’s father Ustath Rashid. Suleiman’s father comes under surveillance, and is also taken in for interrogation. An Egyptian friend called Moosa helps with the destruction of compromising books, but things look grim for Faraj and the family. There are some horrific scenes: Suleiman sees Rashid interrogated with violence on state-controlled TV, and he witnesses the man’s hanging at a sports stadium. His mother tries but fails to prevent the boy from seeing the damage done to Faraj. Any adult reading this book is going to be appalled that the child was not shielded from the violence. However, the characterisation of Suleiman is problematic. As the story progresses Suleiman betrays almost all the people in his life, sometimes in innocence because his parents don’t explain the peril they are in from Faraj’s political activities, but sometimes motivated by a cruelty that isn’t satisfactorily explained. He is brutally unkind to his friend Kareem and at one point, he himself tries to drown a beggar. Once safely exiled in Egypt under the sponsorship of his uncle, he rejects any contact with his old life, refusing to respond to entreaties from his parents or his friend. This is made more shocking by the bland tone in which Suleiman recounts events, like an indifferent observer. Child narrators are not my favourite literary technique anyway, because I tend to find them a manipulative device. By offering only the limited perspective of a child, the author seeks to invoke emotions like protectiveness, pity, or dismay and anxiety about a child’s shallow perspective. However, in this novel, where there are occasional reminders that Suleiman the adult is looking back on events, the narration invites judgement about why he doesn’t feel remorse about some of his more culpable actions. If this omission is intended to show that people are psychologically damaged by living in a repressive state, it’s not very convincing. Suleiman seems rather to be a rather nasty little boy whose mother vacillates between over-indulging him and failing to meet his emotional needs, and he grows up to be a selfish and ungrateful young man. I found myself feeling uneasy about this book. On the one hand, it’s a good thing that an author can raise awareness of breaches of human rights in the form of a novel, but on the other, the reader’s pity for the situation can obscure flaws in the book. In the case of In the Country of Men it seems as if the depiction of an horrifically oppressive state overwhelms the weakness of the characterisation and plot. Lorraine Adams at the NY Times was much more impressed than I was.